Darjeeling: An All-Terrain Vehicle (ATV) hidden under straw heaps and foliage has been unearthed by police in a tea garden in Tukvar, Gorkha Janmukti Morcha leader Bimal Gurung's former stronghold near Darjeeling. The find has sparked speculation about the reasons for the concealment and the owner of the automobile rarely used in the region. Gurung, who has been in hiding after cases were filed against him related to violence during last year's statehood agitation, had been publicly spotted riding an ATV of similar make during a monastery trip in 2014. Darjeeling police have taken to Twitter, posting pictures of the vehicle being pulled out and asking anyone with valid papers or information about the ATV to approach officers. "Based on anonymous complaint, an olive green Polaris ATV with left hand drive has been seized as it was intentionally hidden under suspicious circumstances. Anybody having valid papers or any information about it may please contact us," the police tweet says. The ATV is of Polaris make and the company does not have any dealers in Bengal. It is used mostly by armed forces and adventure-sport enthusiasts. The pictures on Twitter show the police had to tie long ropes and haul up the vehicle with the help of nearly a dozen youths. Gurung had been spotted riding an ATV in Singtom in Tukvar while visiting the monastery, Dichen Tashi Choling Gumba, on October 26, 2014. Photographs published in newspapers show the ATV was also olive green, manufactured by Polaris and had a left-hand drive. The road leading to the Gumba is steep and difficult. In 2014, a 31-member Thai delegation along with the then Indian ambassador to Thailand, Harsh Vardhan Shringla, had gone to the monastery for a ceremony to install a Buddha statue. 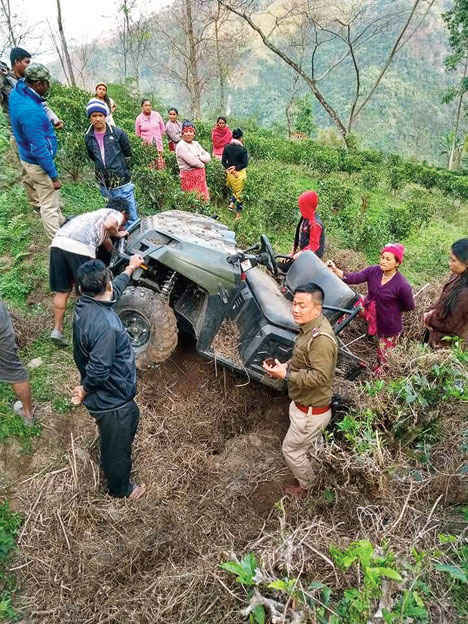 An All-Terrain Vehicle (ATV) hidden under straw heaps and foliage has been unearthed by police in a tea garden in Tukvar, Gorkha Janmukti Morcha leader Bimal Gurung's former stronghold near Darjeeling.